Mary Caperton Morton is a freelance science and travel writer with degrees in biology and geology and a master’s in science writing. A roving correspondent for EARTH magazine, where her favorite beat is the Travels in Geology column, she also writes the popular blog Travels with the Blonde Coyote and her first book Aerial Geology: A High-Altitude Tour of North America’s Spectacular Volcanoes, Canyons, Glaciers, Lakes, Craters and Peaks was published by Timber Press in October 2017. 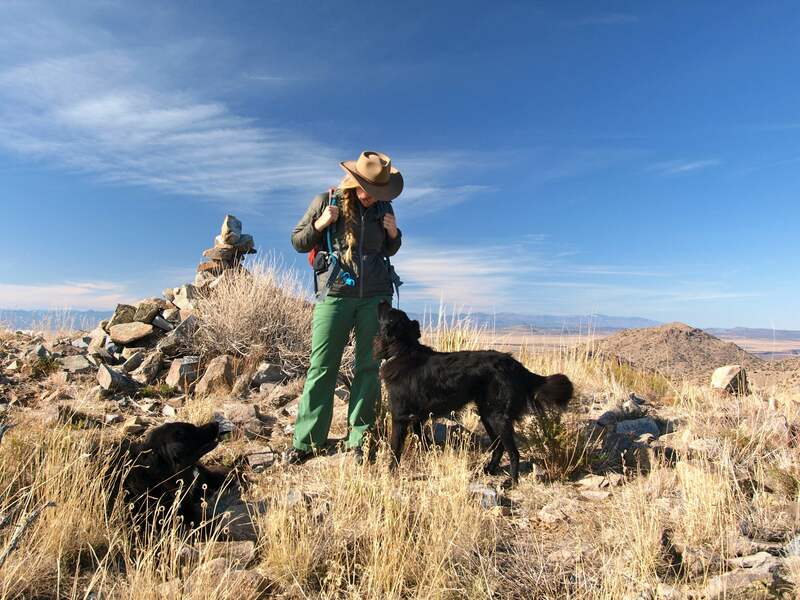 In her fifteen years as a road-warrior nomad, Mary has hiked in all 50 states. When she’s not at the keyboard she can usually be found outside — hiking, skiing, climbing mountains and taking photographs. Visit her website at www.marycapertonmorton.com. About the blog name: The Blonde Coyote is my trail name, which I use to sign trail logs and summit registers. Like most good trail names, mine was given to me by a fellow hiker after many long, hard miles. 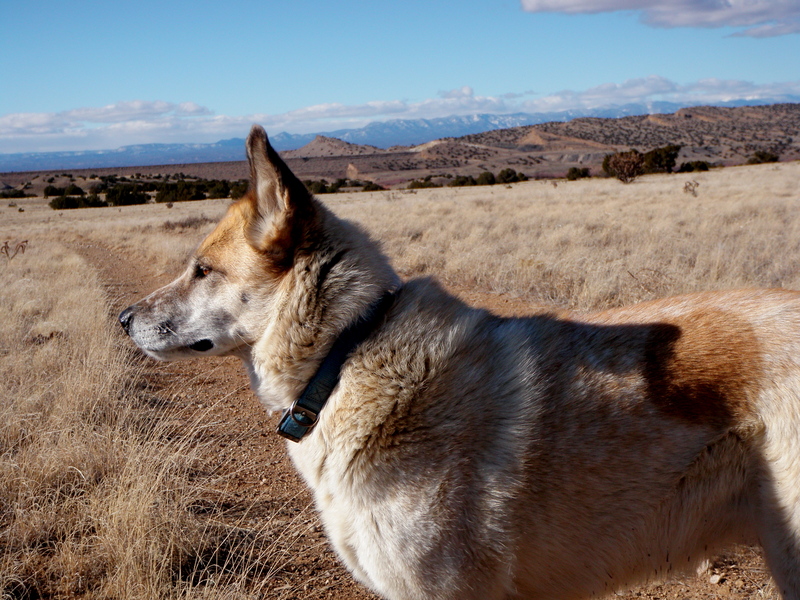 The Blonde Coyote also pays tribute to one of my favorite non-human traveling companions: a deaf coyote-cattledog hybrid named Freckles who was a great ally in my desert wanderings around rural New Mexico. Questions? Comments? Requests? Contact me at theblondecoyote@gmail.com. Beautiful ally you have. How rare to come upon a mix between coyote and dog. Wow, what an amazing story. Coyotes are numerous in South Dakota, and can understand their skittish, wild behavior. My husband is an avid REI shopper; he would have loved listening in on that lecture. Yeah the REI here hosts some great events! I’m going to one in a few weeks on the pros and cons of converting your house to solar power. I already live off grid but since I’m housesitting, I didn’t set up the system and I’m curious to learn more about it. What a beautifull creature. It has to be a free spirit!! I love your dog. He is beautiful. Nice blog! I love the southwest so look forward to following your adventures. Great blog, Mary. I’ll look forward to your future posts. Really enjoyed reading your post and look forward to more! Hello Mary – I stumbled upon your blog the other day and have rather loved your writing and photography. I’m not the writer or photographer that you are, but I was wondering if you would mind if I listed you on my blog-roll so that I can share your gift with my family, friends, and other readers. Thank you, again, for sharing your work. Hi there! Glad you found me and that you’re enjoying the Blonde Coyote. This blog is a great creative outlet for me and I have a lot of fun writing it. By all means, pass it along! Thank you! Hello again – I am glad I found you, too…and thank you for allowing me to share your work. You are most welcome! I can’ believe I’ve been walking around this planet 60 years and only just now stumbled across your site! Well, I guess the first 30 or so you weren’t born yet, but that aside. A kindred spirit, to be sure. Although, obviously, a spirit who has stayed true to her calling unlike me. It was like coming home browsing through your images. Nice website. I came across your blog while looking up information on White Sands. It seems like you’ve traveled the Southwest with dogs and done a lot of it in the winter. I’m heading out there in February and was wondering if you had any recommendations for winter camping/traveling/dog friendly around the time. Hi Michael! Glad you found me. Winter is the best time for a dog-friendly Southwest road trip! You should definitely stop at White Sands and Ghost Ranch, New Mexico, which I’ve also written a post about. Both are very dog friendly and extraordinarily beautiful. In Arizona, the canyons around Sedona are amazing and also dog friendly. In the winter, National Forest campgrounds are usually open, always dog friendly and often free! It’s less than $20 and by far the best resource for planning an off-the-beaten-track road trip. Accept no substitutes! I won’t leave home without mine. What’s your route? I can give you more specific ideas if you know approximately where you’ll be going. So excited to have found your amazing blog. Because I enjoy your blog so much I have nominated you for the Versatile Blogger award; http://www.versatilebloggeraward.wordpress.com. I just wanted to say Hello. Becky FB’d me a link to your photos from your Grand Canyon Birthday hike and I was impressed with your stunning photographs and exciting journey. I’m an outdoor girl and photographer, too. Nowhere near as talented as you, but I so enjoy reading about others journeys and learning about this fascinating and amazing world we live in. Your blog is very nicely done and easy to read, and I’m going to enjoy settling in with a cuppa tea and reading from the archives. Oh and I’ve always been fascinated with EarthShip living, too. Hubby insisted in a ‘standard’ style of home, but perhaps one day we’ll be able to live off grid in a more sustainable way, beyond just growing some of our food during the summer. It’s also wonderful reading about and seeing some of your photos and stories that happen in New Mexico. I’ve lived here in our beautiful Land of Enchantment for over 18 years and I can’t imagine living anywhere else. It’s such a unique, diverse, amazing place to call home. you certainly captured the spirit of the rocky coast! Really like your site and photos. I travel to and have kept an illustrated journal for 20 years. Thanks, Hobo Dan! I wish I could draw, but my doodling skills are pathetic. I’ll stick to taking pix! I stumbled upon your blog from another one and I’m so glad I found it! We live in the desert, near Palm Springs, and frequently travel to Joshua Tree national park. I also explore the canyon between Palm Desert and Anza, called Deep Canyon, and have a blog dedicated to it (http://rav4adventures.blogspot.com) as well as my horse one! Interesting to read about Dead Horse Canyon and yes, I did see the white horse! I’ll be following your adventures from now on! Wonderful BLOG so glad Word Press suggested I read it! Have you read “The Tortilla Curtain” by T.C.Boyle ? There is also a man writing about nature that calls himself pilgrim or coyote, did you get your blog name from there? May the Weather be Good to You Always……. hi mary! just come upon your writing….and what a refreshing start to the day it is, too! i would so like to travel the way you do, BUT…having a family kind of cuts you out of doing certain things! the next best thing i can do is travel in a somewhat regimented way (vacations, to you and me!) and make do with the shots Im able to take doing that. Great dog you have there….very definitely not a dog to keep in the house, unlike Shera, my alsation, who has realised the great comforts of staying indoors most of the time! Hope you dont mind me linking your work on my blog…Im sure lots of my followers will love it! funny u shud say that about the uk…only im on my way to vancouver, bc very very soon…infinitely better scope for walking there i think, being a mountain man! used to live in ontario, moved to uk to work, now back again! cheers for the permission to link! yeah, mary….the burgess shales are based in yoho as you probably know! havent had the time to go take a peek…but i’d love to when i get the time. always wanted to go find my own fossils, but they dont allow that at burgess, as its a protected site! This is a beautiful and well done blog.I love the pictures, stories of the people and places and events in time. What a blessing to be privy to all of that. Your blog site is beautiful and amazing! I was born and raised in New Mexico and I think the Southwest is is the best place to live and travel. Your photos are stunning and your writing is superb! I will definately be following your posts. Happy Trails! I was working on a final project for a visual rhetoric class at the University of New Mexico (I live in Albuquerque) in which I created a newsletter about hiking/mountaineering/backpacking. I stumbled across you here on the web while I was in search of images to use in my project. The picture I found of you standing atop the Pedernal in NM fit into my visual design wonderfully. Of course, I credited you in my citation page. Anyway, the newsletter turned out great! A few more credit hours and I will have a degree in English – Professional Writing. Yay me! Strange thing is that after the project is over and done with I think of your picture, your blog, your writings and the person you describe yourself to be. I am fascinated and intrigued by you and of course I want to follow along with you on your journey. I think I will check in from time to time to see what you’re up to and how you are doing……. Will travel with you via your blog. My name is Kelly Smith and I am a freelance art director who works on tourism advertising for Cook County. I noticed your photograph of your dogs and your feet on the shore of Lake Superior and wondered if we could use your photograph in any upcoming ads for Cook County. I don’t have any concepts yet, but I’d like to get some images in the mean time. As a Southwest/horse/dog lover, so enjoy your blog, Mary. TJ Holmes is making it her life work to document these horses while leaving them wild (but also lessening their fear of humans a bit). You will love her pictures – especially of this year’s new babies. The folks in Colorado/Utah who help with this “contained” herd of wild horses have made real progress with BLM’s methods of dealing with the horses. Spring Creek Basin is a magnificent area for the Spring Creek group to call home. Thanks Barbara! I’ll definitely check this out. The plight of wild horses in this country endlessly fascinates me. Glad to hear this group is doing their part. To paraphrase Ed Abbey: Wildness needs no defense, only more defenders. You recently visited with my brother at Lake Tahoe, hiked in Squaw Valley and had dinner with him. Ted (Tahoe Ted) mentioned you may be coming through Wenatchee, WA where we live. Any chance of meeting you if you are near here? Really happy to have found your blog. My first trip to the States was a road trip with my then-girlfriend in 1993, living in two different vehicles we bought there while driving 10,000 miles over three and a half months. Unforgettable. I’ve been back three times to do long hikes. Love your pictures and will be following your travels with interest. Luck to you! Hi Blonde Coyote I Love your Blog and have nominated you for a sunshine award! hope you are enjoying your time off! you made it to Alaska! Hello! I love your blog, and just nominated you for the Very Inspirational Blogger Award and also posted a link to your site on my blog. You can accept and read what it’s all about here: http://southwestadventurer.com/2012/08/19/very-inspiring-blogger-award/ . Thanks again for the wonderful blog! I envy your journeys. How I wish I could just pack up and drive my little subie all over the place, but well, you know how money tends to be a factor- though I would love to never need any! I’ve got a random question for you. Where did you get your teardrop?? I’m on a mission to find one, fix it up and spend my summers leaving tires marks in the dirt. I’d love to know where you got yours! Thanks for the info!! I started looking at teardrop.net before. I’d love to get a ‘project’ one! I’m in the process of getting my teaching license… I can’t wait until I have summer off to just pack up and leave! My wife and I found Teakettle Rock this afternoon the same way you did. We stumbled upon it during a late afternoon drive with our 14 year-old Weimaraner, Dietter. What a gift! We really enjoyed your post about this beautiful treasure. We have a cabin on 96, near Coyote. Decided to take a drive and were blown away by the rock. The light was getting bad and we didn’t get any good pictures. You popped up on Google when I looked for a picture. We intend to go back in a few months when we are back in Coyote. Enjoy your travels. I enjoyed your blog. Hi Mary, I am so inspired by the success of your blog and making it into a profession that I have nominated you for the 2012 Blog of the Year Award. Congratulations ! Emily aka Bella. You are a great inspiration, love your site. I found your blog listed through freshly pressed. congratulations. I lived in New Mexico for many years and am looking forward to reading about your take on the countryside and photos of the same. it is a land that truly becomes part of your soul, I know I miss it very much. Just wanted to let you know that I’ve awarded you a Best Moment award. Aw what a sweet travel companion! Just found your blog and it’s great! Really impressed with your travels in that little teardrop camper! Freckles reminds me of our dog Roxie, and looks very similar. Ours is a ‘Grey County Mutt’, but I’ve often wondered if there isn’t a little bit of coyote in her. Look forward to following your blog. I love your photographs . I live in the mountains and relate to your writing. I left a comment on an entry but realized that may not be the best place to leave this particular comment/question. Here goes: I am a photographer as well. I’m wondering how you ‘manage’ your images. You have a terrific metadata system going on both your blog and images. I have used Lightroom in the past and wondered if you wouldn’t mind illuminating how you work with your images. You do amazing work, both written and photographically. I am incredibly impressed and enjoy reading your journeys. I wish you the very best of luck and safe travels. I hear you. I spent several days one winter ‘tagging’ photos of mine. I’ve gotten sloppy about it though and now my photos just get sucked into various hard drives. I also hope to get on top of this in the near future. A geologist, a writer and a dog lover! I think we share a few interests there………. You are living “The Dream Life” I long for. g’day Mary, love your blog and philosophy ! I’ve always tried to freecamp here in Australia, and when I retired last year I went on a 10 month road trip freecamping out in the bush when ever possible. ( http://latitudesandattitudes.net/2013/12/09/one-year-of-retirement/ ) apart from keeping costs down there is nothing like sleeping in my swag (bedroll) under the stars whenever possible, way outback. your little camper would have been luxury to me ! Keep up the great photography and writing. Always a pleasure to read your blog. I’m glad to have stumbled upon you. great blog, I am looking forward to exploring more. I was surprised to see your Trilobites from North America. We bought one when we were in the Atlas Mountains in Morocco .Fascinating ! I’m an undergrad at KSU working on a mountain geography project. I was interested in using your image of your summit on Mt. Elbert and wondering if you willing to share a few lines on why Mt. Elbert was significant for you to climb. Hello! I just recently embarked upon my bucket list dream of traveling around the country. I sold nearly everything and bought a 19ft pop top conversion van. After my first 43 days on the road, (which I loved!!!!) I’m hanging out with my kids in MD ( started in NM) for a month. Then I’ll be headed to the New England area for the end of summer and the fall. I’ve signed up to follow you. I’m accumulating a nice list off followers myself. Please check out my blog at http://www.lifeismine.org, especially my feature called BRIGHT SPOTS! Thx for the boondocking tips! Hi Mary, your blog and your journey is really amazing. Would love to follow you for the future posts. Nice to meet you. Your blog is one of the first I followed when I got into WordPress, and I always come back to it. Your travels and lifestyle inspire me. I enjoy reading your blog. Today while glancing at your recent posts, I noticed you grew up in Lancaster (Strasburg) PA. I live in the Lancaster area. Here’s a photo of the moonrise (aka: supermoon!) in Strasburg two nights ago! I just have to tell you how much I have enjoyed stumbling upon your blog! Currently working on a term paper about flat-slab subduction beneath the Altiplano-Puna Volcanic Complex, and read your article in Earth (leading me here whilst dwindling into procrastination mode). As a graduating senior in geology, I have to say you have inspired me with your wanderlust and fanciful writing! Rock on. Hope to run into you and your beautiful dogs on the trails one day. What a cool blog and life! Hey Mary! Long time! Just wanted to check in and say you are awesome and an inspiration. I see you’ve traveled so, so many places since college. Keep up the awesomeness. I just read your adventure to Colorado River from Supai, I must say, it was by far the most detailed and best photos I’ve been able to read about. I’m planning on trying it next month and your great documentation and photos really inspired me to go and helped prepare me! Thanks and safe travels! Found you through your Forrest Fenn article! Lovely! If you want a good shot at seeing FF’s treasure in situ you must be capable of recognizing when something must be turned upsidedown or flipped right to left to get to the end of that golden rainbow! Kudos! I have always resonated with the wolf/dog crosses so I ‘get’ your partnership with Freckles. Just found you so will poke around and check out your pad. You should check out my friend’s blog about her travels. She’s been solo traveling with a dog for years now. Tents, teardrop, and now a vanagon. I look forward to following your adventures! The blonde coyote, what a great name. Just started following your blog, it’s terrific! Also great to hear you’ve set up shop in Big Sky, it’s one of my favorite towns West of the Mississippi. Keep up the amazing work! Spring is here. Whats on your agenda? Need a treasure hunting partner. Where are you? I miss your posts. Hope all is well. I am in the fledgling phase wanting to buy a camper and take off with my dogs across this awesome country. I’m so glad I found you and will be reading some of your 500 blogs😶!! Im loving your stories as I’m planning my solo getaway asap, its a loooong story. I like the way you write! Very good. I read your article about the Fenn treasure. It’s an interesting thing, this article. I first read it months ago when I first started researching and hunting for the treasure myself. I convinced a friend of mine to go with me to NM to blaze a trail (pun intended) looking for the shiny box. Well, obviously, we didn’t find it. Returning home, along the superslab of I40, the monotonous metronome of the seams in the roadway was only chatter in the truck. We were both pondering where we had been, the amazing things we’d seen, where we went wrong and whether it was real at all. Suddenly, we broke into debate and some serious treasure hunt synergy. It became apparent that we were viewing things wrong initially, and seeing the county in northern NM makes all the difference in regard to understanding how the poem may fit. That trip was last September. We are planning a new expedition for this month or June, charged with all sorts of new solves, observations and leads. Just tonight, while researching Taos, I ran across your article and read it anew. It was unbelievable how different it read now as compared to then. It’s as if I didn’t know enough base information to even grasp some of the things you were sharing. Very cool Indeed! So, I just had to drop you a line and say thanks for a well written story, and I’d like to say you’re adventurous philosophy of life is wonderful and admirable. Never stop exploring!